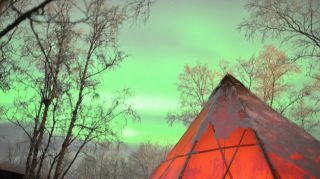 If you can't make it to Sweden to see the Northern Lights, the next best thing is a new video of the aurora lights compiled from thousands of hours of observations by videographer Chad Blakley. Blakley captured the glowing green and purple lights of the aurora borealis between 2012 and 2013 from Abisko National Park, one of the world's best spots for sighting the lights. He then compiled his footage in a new way to avoid the normal pitfalls of time-lapse photography and provide a view closer to what the eye would see in real-time. "The film uses a new time-lapse technique that allows me to show you the auroras in a way that I never thought possible — virtual real time," Blakley told SPACE.com. The stunning aurora video showcases one of the strangest, most haunting sights on Earth. The aurora borealis, also known as the Northern Lights, are created when charged particles from the sun slam into particles in Earth's atmosphere toward its poles, where the solar material is driven by our planet's magnetic field. When solar eruptions release large bundles of material out into space, they can cause geomagnetic storms when they reach Earth, stimulating particularly pretty aurora displays. Blakley is hoping more such eruptions occur soon. "The countdown to our first major aurora of the autumn has begun!" Blakley wrote in an email on Friday (Aug. 16). "My wife and I are traveling in the south of Sweden and I was able to capture the first minor geomagnetic storm with my camera last night." You can watch the full HD version of the video at Blakley's Vimeo site.